Órgiva has several supermarkets, each with its own personality. None of them are, thankfully, like the monumental Al Campo in Motril which once managed to squeeze a pet shop into it. Here’s our take on each one – should you need baby wipes, olive oil, washing powder – or a bottle of Tabasco. The map below shows where they are. Like many Spanish towns, you’re never far from some kind of shop – and normally just ten metres from a bar. It’s amazing they can all exist alongside each other. Bright and stacked to the ceiling with products – if you’re from the UK, it’s a bit like the Co-op. A good place for vegetables (Órgiva’s Thursday market aside) and for things like olive oil, jars of beans and dairy products. It has a large selection of crisps, soft drinks and beer (they just need to put a TV in the corner showing the football). Normally busy and popular with both locals and visitors, it has good offers and prices. If you’ve hiked into town and are sweating by the bucket-load, the arctic air-conditioning should sort you out. Open Monday to Saturday, 9am to 2pm, 5.30pm to 9pm. This chain (the ‘green one’) seems similar to Tesco Metro or Spar. 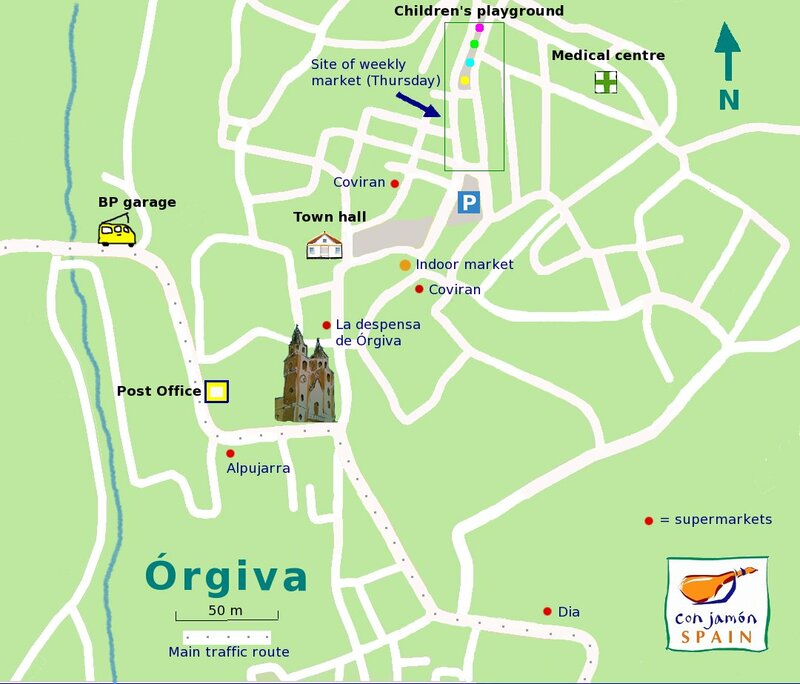 There are two in Órgiva – one on Calle Granada, north of the main square and the other a stone’s throw away back into town. Both have meat and deli counters. Open Monday to Saturday, 9am to 2pm, 5pm to 8.30pm. Our favourite. It sells stuff we can’t find elsewhere – like fresh ginger, chillies and coriander. Unlike Dia, there are also ‘proper’ counters where they’ll slice and weigh jamón and cheeses – there’s a butcher section too. There’s less choice of the basics but, for some people, it may have the advantage of selling certain products, like Marmite and All Bran. There’s a decent wine and Cava selection (note the separate displays for better wines) and a broader range of spirits than other places – last count there were ten types of rum. Oh, and the staff are really lovely. OK, it may be pushing it a bit to call it a supermarket, but, as you descend the steps from the street, you sense that this may have once been Órgiva’s main grocery store. It’s compact and sells most of the basics. Charming in an old-fashioned way, we imagine some people haven’t shopped anywhere else for decades. It has a small meat counter and perfumed toilet bags (trust us, this can be important). The circular market over two levels (not to be confused with the weekly outdoor one) is south of the main square and is open from 9am to 2pm, every day except Sunday. As you’d expect with a market, it has a wide variety of shops and booths. There’s a bakers, plant shop, various food outlets and, importantly, a fishmongers (closed Mondays). There was once a colony of cats here. Maybe it was the fish. Supermarkets are closed, but see our shops post about where to get stuff.